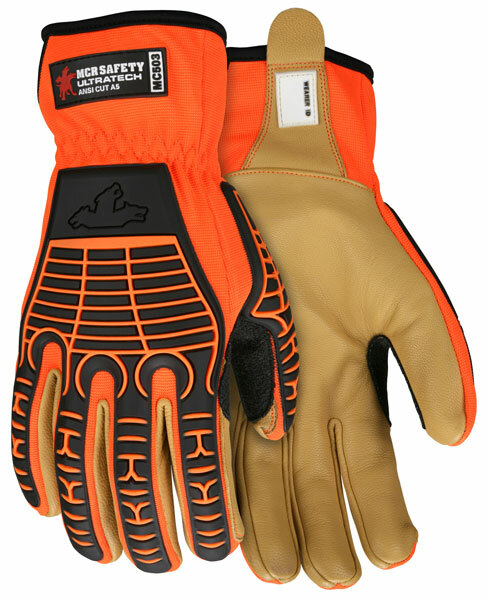 UltraTech™ Multitask, MC503 glove is a tough glove with amazing features. The MC503 features a 2-way hi-vis orange material on the back with an exclusive TPR design that provides excellent coverage for back of hand protection. The palm of the MC503 features premium goatskin, lined with DSM Dyneema® Diamond Technology. The Diamond Technology liner provides excellent cut protection. The thumb crotch reinforced with coated DuPont™ Kevlar® provides additional protection in a critical high stress area. Other features include a comfortable open cuff design with pull tab of secure donning and ID panel on the wrist for user personalization.